Jose Ariel Rivera, 31, is serving time at Evans Corrections Institution in Bennettsville, South Carolina. Prisoners are using smuggled cell phones to access social media and brandish weapons, boast about drugs, and live broadcast their exploits from inside prisons. The problem is nationwide, but South Carolina prisons have garnered particular attention due to media reports exposing the prevalence of the problem there. 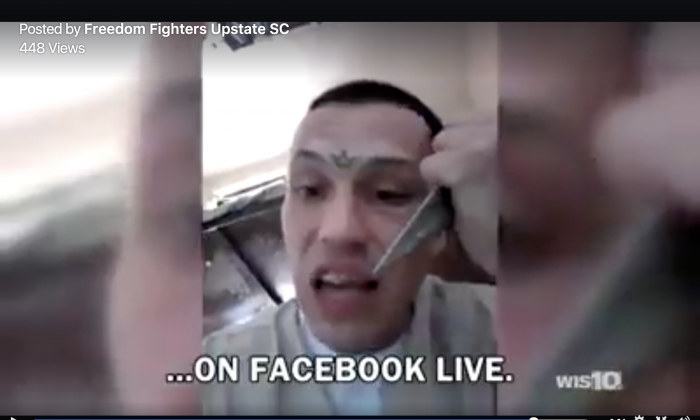 One inmate serving a 10-year sentence for burglary likes to post live videos where he shows off his knife and talks about the prison’s security holes. The inmate, Jose Ariel Rivera, 31, is serving time at Evans Corrections Institution in Bennettsville, South Carolina. A call to the South Carolina Department of Corrections (SCDC) for comment was not returned by the time of publication. SCDC’s Facebook page—which in recent months is almost entirely recruitment ads—makes no recent mention of how the issue is being addressed, though the SCDC twitter feed does include retweets of an article calling for a legal change to allow prisons to block cell phone signals. Another retweet calls on the public to report inmate cell phone usage. Rivera has already been reprimanded twice this year, reports WRAL, but still went on Facebook live to deliver another profanity-laced post. “Prison officials said he has lost privileges, but the post shows he’s able to skirt the system,” reported WRAL. Correctional departments across the country have struggled to contain contraband and cell phones are on a long list of items and substances prisoners have smuggled in. The SCDC has a special page on its website set up to allow the public to report prisoner cell phone usage. Prison officials have said the only solution to the problem is to block the cell phone signal so prisoners can’t use cell phones even if they do manage to smuggle them in. But jamming the signal of cell phones, even just around prisons, is illegal under a long-standing provision of the 1934 Communications Act. There was a legislative effort in 2009 to reform the act to allow cell phone jamming, but it failed. Beyond using cell phones to reach the outside world and boast about in-prison exploits, prisoners have also used cell phones to access social media and organize work strikes. One work strike targeted a company that provides meals at correctional facilities, while another called for an end to inmate work programs. While not all states prohibit prisoners from using social media, all ban them from having cell phones. Enforcing that ban, however, has proved all but impossible. At the most serious extreme, illegal cell phones are used to commit crimes in the outside world. In one disturbing incident, a Georgia gang leader used a contraband phone to order the assassination of the baby nephew of a rival gang member. Cell phones have also been critical to ongoing criminal enterprises carried out from within prisons. The U.S. Attorney’s Office for the Northern District of Georgia charged 50 people in January 2016 for conspiring to commit wire fraud, money laundering, and accepting bribes to smuggle contraband into Georgia prisons. “The unfortunate common denominator to this criminal conduct is the pervasive availability of contraband cell phones, which allows too many prison inmates to continue victimizing our communities while serving their sentences,” said U.S. Attorney John A. Horn in a statement.